Glenn and Carolyn Brinkman chose to live in Athens to enjoy the blue skies, green trees and small town lifestyle. They don’t want pollution from a proposed new coal-powered electrical plant near Fairfield to change that atmosphere. The Brinkmans are part of a group of about 25 Athens-area individuals called “The East Texas Environmental Concerns Organization.” The group opposes any efforts to grant a permit for the plant before its effects on the air are considered. They believe newer technologies should be explored. The Fairfield plant is one of 19 proposed by TXU Electric around the state. There are already two plants at Big Brown, a large TXU coal power complex in Freestone County. Glenn’s interest in the air and outdoors is not new. He earned a forestry degree almost 50 years ago. Then, for years he made his living raising cattle. In March, he received a Pioneer Award, recognizing his contributions to the Brangus Breeders Association. Today, the Brinkmans own land in Anderson County not far from Big Brown. Glenn said he can see the glow of fire from the coal plant when he’s out working cattle. 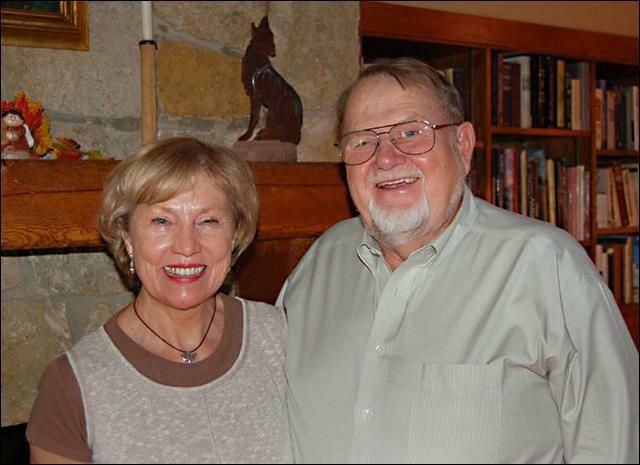 Carolyn and Glenn have been married 46 years, and after stops in and out of Texas, they settled in Athens in 1993. Carolyn, a classically trained musician, has been pianist at the Athens Presbyterian Church for several years. Carolyn serves as vice president of ETECO. The president is Margaret Rands, who moved to the area after retiring from county government in Santa Clara, Calif. Rands had relatives in the Athens area and had visited for about 25 years. The Brinkmans say Rands has long had an interest in environmental issues. Other officers in the group are Alisa Anderson, secretary, an English teacher at Athens High School; and Bob Renk, a retired Trinity Valley Community College professor. They are working on organizational bylaws, and expect to have a web site ready soon. The Brinkmans first became interested in coal-powered plants after reading the book “Big Coal,” by Jeff Goodell. “It reads like a novel,” Glenn said. Big Coal gives a history of the coal industry in the U.S.
“The book doesn’t castigate everyone, but explores some of the dangers,” Carolyn added. Carolyn said the people of Fairfield won’t see most of the pollution. “That’s why the smokestacks are so high, so the smoke is carried away. A bigger smokestack is not going to solve the problem though,” she said. The smoke, Glenn explained, is carried by the prevailing southwesterly breeze across Anderson County into Athens. In it, they say, is methane, hydrocarbons and carbon monoxide — byproducts of the gasification process that changes the solid coal into gas. The ETECO plans to meet again 6.30 p.m., Monday, November 13, at the East Texas Arboretum. “We scheduled it after the election because we didn’t want it politicized,” Carol said. Another important date, according to the Brinkmans, is November 28, when a public hearing on the permit protest will be held at the Fairfield High School Auditorium. The hearing will be conducted like a civil trial, with a judge presiding. The Brinkmans don’t know who’ll be speaking yet, but Glenn hopes because he owns land in the Fairfield area he’ll get a chance to state his views. The meeting starts at 10 a.m.
Carol and Glenn Brinkman of Athens are members of The East Texas Environmental Concerns Organization. The organization is protesting TXU’s proposed construction of a coal-powered electrical plant near Fairfield.